When there are crimes to be covered up, mysteries to be wrapped in enigmas, or a murderer to be liquidated, there is only one man who can be trusted with the task: Felix Culpepper, tutor in Classics at St Wygefortis' College, Cambridge, and assassin-at-large for the British Establishment. Look no further for the perfect summer read. Outlandishly funny. Thrills to make you shiver, hilarity to split your sides. Read it! The world of letters presently has far too few tutors in Greats at St Wygefortis' College, Cambridge, or in fact assassins-at-large for HMG. That it has now gained one of both can only be regarded as an excellent application of what Culpepper himself doubtless would call the omnibusses-all-at-once rule. A twisted, amazing tale from a talented author. How often do you find a comic hero who infuriates you, grosses you out, and makes you laugh until you fall down? Major's Culpepper is marvelous and malign. Brilliantly witty, extraordinary ideas delivered in sumptuous sentences. Completely original. A book of immense creativity and wit. A delightful waltz through a dark but enjoyable world created by Richard Major. 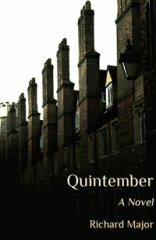 Besides suspense, wry giggles, linguistic pleasure and lashings of bombast each of Culpepper's cases delivers multiple tales: good value on every front. I thoroughly enjoyed it and look forward to other works by this talented author! Witty, unique, and refreshing. Lots of laughs! Mr.Major has written a triumph of a book. Engaging, multifaceted, a joy to read. Superbly languaged, funny and fascinating. No question that Major is the greatest comic novelist in English since Evelyn Waugh. I laughed, I cried. Bring on the sequel! Wit, brilliance and wonderment lurk around every corner! Hoorah for an intelligent new sleuth with the added bonus of mirth and fun. Is the 'proper' job Richard Major has been searching for? Looks like it to me! Engagingly devious: H. H. Munro ravished by Simon Raven. Richard Major is an incredible talent - can't wait to read more! This book is the love child of _The Name of The Rose_ and _Lucky Jim_. Brilliant, glittering, fun, addictive. What a ride! One of the most unique, scary and funny reads ever. Worth a second trip.